With a stable housing market, low interest rates, and a more positive employment picture, more Americans may be in a position to buy or sell properties in 2017. Moreover, the U.S. tax code favors real estate ownership, allowing for tax savings that might help families enhance their everyday lives and build wealth over the long term. The ability to write off mortgage interest and other home-related expenses can help subsidize a home purchase. Homeowners must itemize deductions on Schedule A of their federal tax returns instead of claiming the standard deduction. 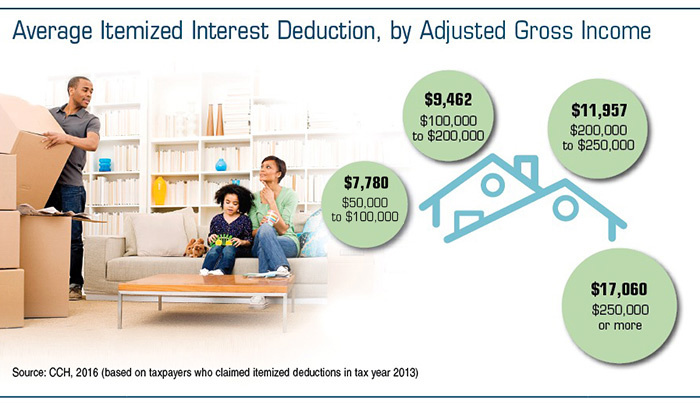 The deduction for mortgage interest applies on up to $1 million for first mortgages — plus up to $100,000 on home-equity loans — for a primary residence and a second home such as a vacation condo, mobile home, boat, house trailer, or any structure with sleeping, cooking, and toilet facilities (if it is not rented for income). The property owner can also deduct real estate taxes in the year they are paid, as well as mortgage points (origination fees) — even if the seller pays them for the buyer. When a principal residence is sold, losses are not tax deductible, but a profit of up to $250,000 ($500,000 for married joint filers) may be excluded from the federal capital gains tax. To qualify for the exclusion, the home must have been owned and occupied as a principal residence for two out of the five years before the sale. Owners who cannot pass this test may be eligible for a reduced exclusion, but only if the home sale resulted from an employment relocation, health reasons, or certain other unforeseen circumstances. Because rental property is considered business property, mortgage interest, property taxes, insurance, maintenance, depreciation, and other expenses are tax deductible and can be used to offset some or all of the rental income. Depreciation is calculated on a straight-line basis over 27.5 years, which means about 3.63% of the entire purchase price may be deducted each year, even if the property is largely financed. Under IRS Section 1031, when a qualified (non-owner occupied) investment property such as a rental home is exchanged instead of sold, the capital gains tax may be postponed indefinitely as long as the transaction is documented and conducted properly. The seller must purchase ‘like-kind’ property (i.e., real estate must be exchanged for real estate, but it need not be the same grade, quality, type, or class) of equal or greater value within 180 days. IRS rules mandate that the proceeds from the sale of the original property must be held by a third party (such as a qualified intermediary), and the exchange process must meet a number of other specific conditions. There are inherent risks associated with real estate investments and the real estate industry, each of which could have an adverse effect on the financial performance and value of a real estate investment. Some of these risks include a deterioration in national, regional, and local economies; tenant defaults; local real estate conditions, such as an oversupply of, or a reduction in demand for, rental space; property mismanagement; changes in operating costs and expenses, including increasing insurance costs, energy prices, real estate taxes, and the costs of compliance with laws, regulations, and government policies. Real estate investments may not be appropriate for all investors.